The other day, I saw the Shopping Mom on TV doing her grocery shopping with discount coupons. Her shopping cart was filled with grocery items but she ended up paying only 89 cents. Amazing, huh! I see a lot of those discount coupons in the mail, newspapers, and in shopping center flyers but I have not made use of them. I have friends who were were able to get huge savings through discounts coupons. I should be using those coupons, too. After all, every bit of money saved, even when it's not much, goes a long way. People shopping online can also enjoy discounts. I've done my online shopping several times and taken advantage of promotional offers and and free shipping. 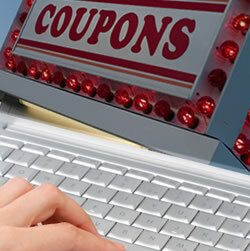 And, of course, there are also onecall coupons that give discounts. Yes, we should take advantage of those coupons and other discounts that companies usually offer their customers. It is wise to economize and stretch our dollar to the limit. Thanks for the post. God bless you all always.